Members of the ruling party AKP hanged the party banner on a minaret of a mosque, making political propaganda at a religious center as Turkey is heading to the local elections that will be held on March 31. The party banner was hanged on a mosque in a district in the western Turkish city of Aydın. The residents and social media users have criticized President Recep Tayyip Erdoğan’s ruling party for abusing religious symbols and sentiments for political interests. The ruling AKP party has covered all the city centers, squares and highways with party banners and propaganda materials, particularly in İstanbul and Ankara. The government party uses universities, mosques, public schools, public hospitals, and private business centers and buildings for political propaganda, leading to an unfair electoral contest around the country. 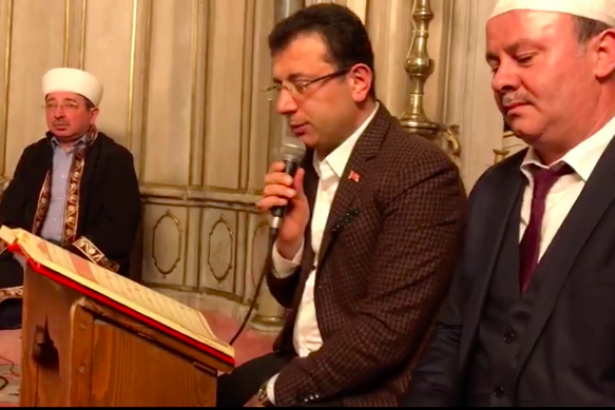 AKP İstanbul mayoral candidate: "Decorating airports with mosques is a requirement of our faith"
Meanwhile, Ekrem İmamoğlu, İstanbul metropolitan municipality candidate of Turkey’s parliamentary main opposition Republican People’s Party (CHP), recited verses from the Islamic text, Quran, at a mosque in İstanbul’s Eyüp district. İmamoğlu attributed his performance to the victims of the mosque attack on March 15 in New Zealand. İmamoğlu, like his political rivals, has also been criticized for abusing religious sentiments for political ends. All the bourgeois political parties in Turkey resort to religious references and practices to the detriment of secularism. Turkey has witnessed a rising trend of Islamism and religious transformation in recent years, particularly during the rule of the AKP government for 17 years. Including the so-called secular CHP party, all the bourgeois parties gave up secularism. Erdoğan’s AKP party and the fascist Nationalist Movement Party (MHP) are to participate in the local elections in an electoral alliance, the People’s Alliance, while the opposition parties such as the CHP and the nationalist İyi Party, split from the MHP, are running in the National Alliance. The Communist Party of Turkey (TKP) is participating in the elections with its candidates for metropolitan and district municipalities and mayoral councils in all 81 provinces of Turkey. The communist party’s slogan for the elections are, “If money has its reign, the working people have their communist party” and “We are not in the same boat”.